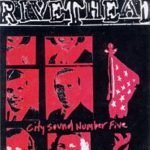 A six song EP, this was the first thing Rivethead ever released. We were all 19, 20 years old at the time so it’s appropriately raw and fast and all that. I think it holds up pretty well though! I wish we hadn’t included all the samples, but oh well. This record is long out of print and isn’t on any of the streaming sites, but it looks like some enterprising soul threw the whole thing on YouTube, so you can enjoy that below.